A game that everyone was ready to hate turns out to be yet another winner on the growing roster of great Nintendo Switch games. Some ideas are just made to be hated. 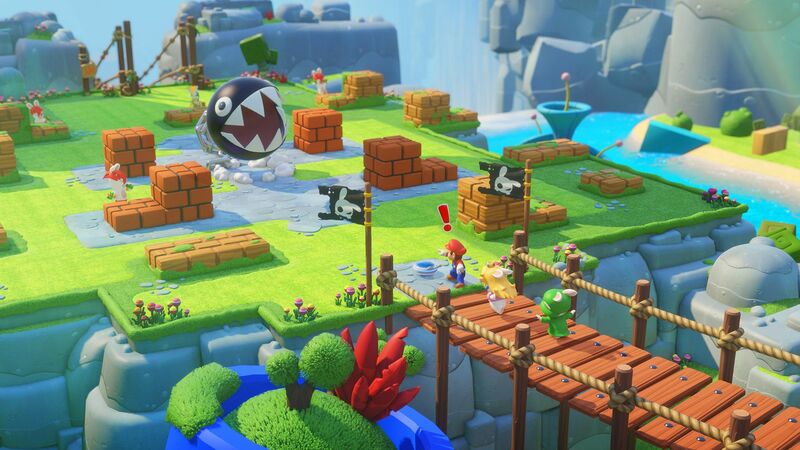 Mario + Rabbids: Kingdom Battle is one such idea. To understand why, look no further than the Rabbids, who are kind of like the Minions from Despicable Me, except they’ve been around longer and primarily exist to be obnoxious, not cute. The Rabbids were huge in the late aughts, starring in a number of party games that were a huge hit among younger players, with just enough conviction in their rambunctious humor to entertain the adults who played with them. But that was some time ago, and when news leaked last November that the Rabbids were crossing over with Mario in an upcoming Nintendo Switch game, there was little reason to be excited. As beloved as Mario is, he’s got a history of being thrown into abysmal games just because he’s, well, Mario. 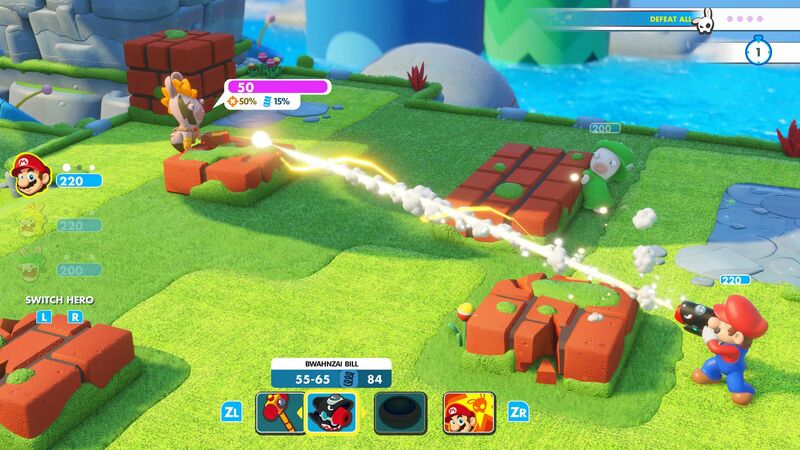 Then Mario + Rabbids: Kingdom Battle was finally shown off at this year’s E3, and well, hating on it suddenly seemed silly—it looked great. Now the game is out, and not playing it is what seems silly. Mario + Rabbids: Kingdom Battle is a game of contradictions. It mashes up two franchises that couldn’t be more different, in a genre they don’t belong in, doing things that they’ve never done before. It gives Mario a gun, features a talking Roomba, and expects kids to get bidet jokes. It’s brilliant. It’s also hilarious in the way it explains how this weird mashup happened: When you start the game up, you meet a girl genius that has invented a visor that literally takes one thing and combines it with another. 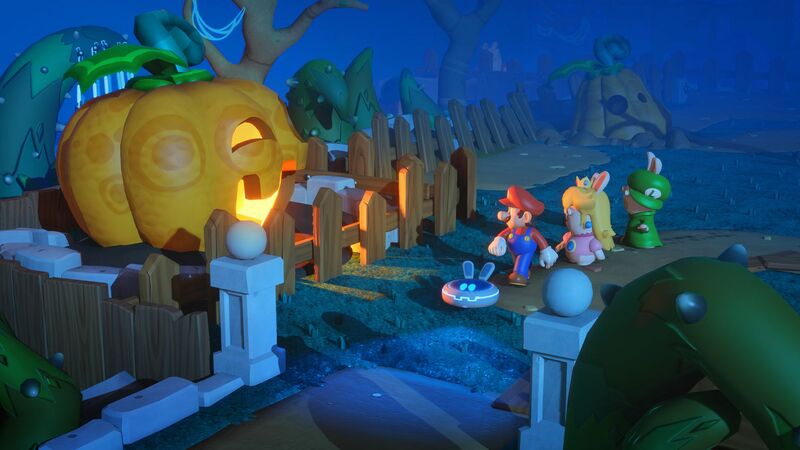 Somehow, the Rabbids invade her world, steal the device, and cause it to wreak havoc on Mario’s world (this girl, she’s a big Mario fan) warping and zapping their way into a twisted version of the Mushroom Kingdom. In order to revert the chaos, Mario, Luigi, and a few friendly Rabbids that dress up as their favorite Mario characters embark on a journey to find the Rabbid who stole the device, taking on an army of mischievous, warped Rabbids along the way. Mario + Rabbids: Kingdom Battle was finally shown off at this year’s E3, and hating on it suddenly seemed silly. Now the game is out, and not playing it is what seems silly. Kingdom Battle is both a tremendously fun game and a perfect introduction to strategy RPGs. It’s deceptively simple, with attainable goals and brief tussles that still remain challenging. It’s full of ways to break up the pace, with areas to explore and secrets to find in between each battle, along with special challenges you can take on with a friend, each controlling two characters. It’s also surprisingly funny—the slapstick mania and irreverence the Rabbids bring to Mario works tremendously well thanks to pitch perfect animation that displays an innate understanding of comedic timing and physical humor. It leans so far into stupid it lowers your guard, making you vulnerable to things like a well-placed, very dumb, and hopelessly funny selfie joke. It’s a rare, surprising treat to get to play a dumb game that’s this smart.